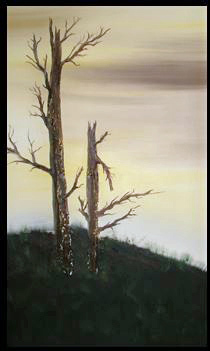 “After the Burn’ is painted wet on wet on double primed canvas. It depicts the birth of trees after the forrest, burned. Once taken down by fire a new day dawns and the remaining trees survive. This painting rejoices in re- birth and new beginnings. Currently unframed Size: 28″ x 22” please inquire about framing prior to shipping.